Rob Kiser/Call Photo Rob Sanford is presnted the Piqua Open Person of the Year award by tournament manager Bonnie Davis. Rob Kiser/Call Photo Alex Cretsos hits a forehand return against Zach Clendenen in the Piqua Open men’s open singles championship match Monday. Rob Kiser/Call Photo Zach Clendenen launches a serve against Alex Crestos Monday in the Piqua Open men’s open singles championship match Monday. There was a familiar name in Miami County tennis taking home the champions plaque from the men’s open singles competition at the Piqua Open tennis tournament. Zach Clendenen, son of Von Clendenen, defeated Alex Cretsos 6-1, 6-2 in the championship match. 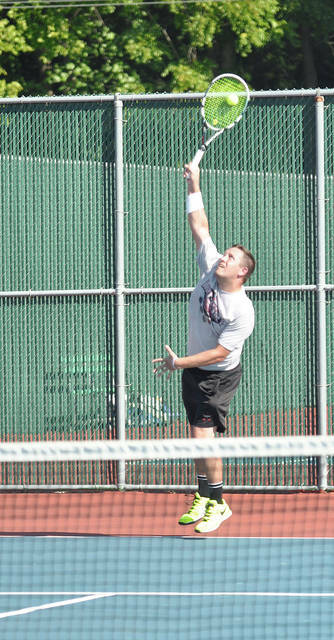 Von has won numerous County tennis titles, while Zach and Von have multiple doubles titles in the Piqua Open. That’s because Clendenen had taken two and a years off from the game until recently. And he was immediately tested. After beating Mike Ritze 6-0, 6-1, he faced past champion Dickie Miller in the semifinals, winning 7-5, 6-2. In the finals, it was a contrast of styles, with Clendenen’s power game winning out. Clendenen said with more than just power. “I wouldn’t say power, I would say experience,” he said. 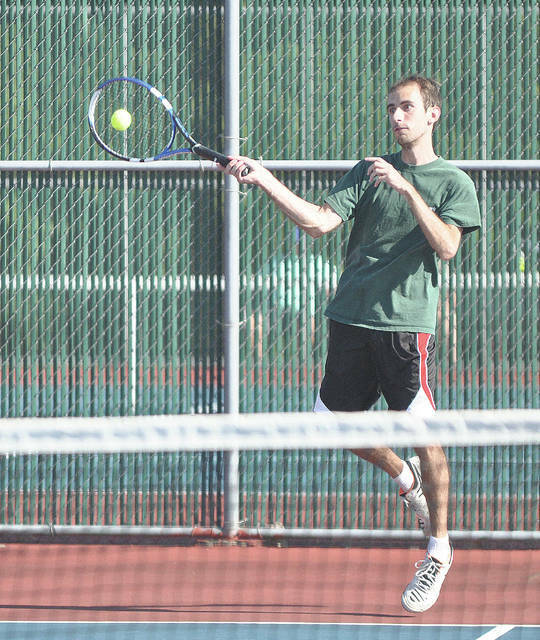 Cretsos, who played first doubles for Troy during his high school career, had advanced to the finals with a 6-2, 6-3 over Sean Hatke and was leading defending champion Kosal Tith 4-3 in the first set of the semifinals when Tith had to retire. The participants just appreciate the job Bill Adkins and Bonnie Davis have done to keep the tournament going. In a first-round match in the open singles, Chad Arnett defeated Chris Hufford 6-2, 6-3. Tith advanced to the semifinals with a 6-4, 2-6, 6-3 win over Arnett, while Miller advanced to the semifinals with a 7-6 (7-5), 6-2 win over Tim Ungericht. Rob Sanford was honored as the Piqua Open Person of the Year Monday. 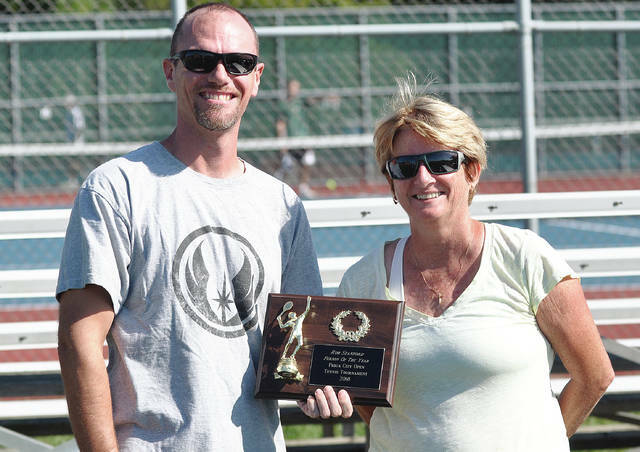 https://www.dailycall.com/wp-content/uploads/sites/30/2018/09/web1_sanford-3.jpgRob Kiser/Call Photo Rob Sanford is presnted the Piqua Open Person of the Year award by tournament manager Bonnie Davis. https://www.dailycall.com/wp-content/uploads/sites/30/2018/09/web1_alex-3.jpgRob Kiser/Call Photo Alex Cretsos hits a forehand return against Zach Clendenen in the Piqua Open men’s open singles championship match Monday. https://www.dailycall.com/wp-content/uploads/sites/30/2018/09/web1_zach-3.jpgRob Kiser/Call Photo Zach Clendenen launches a serve against Alex Crestos Monday in the Piqua Open men’s open singles championship match Monday.